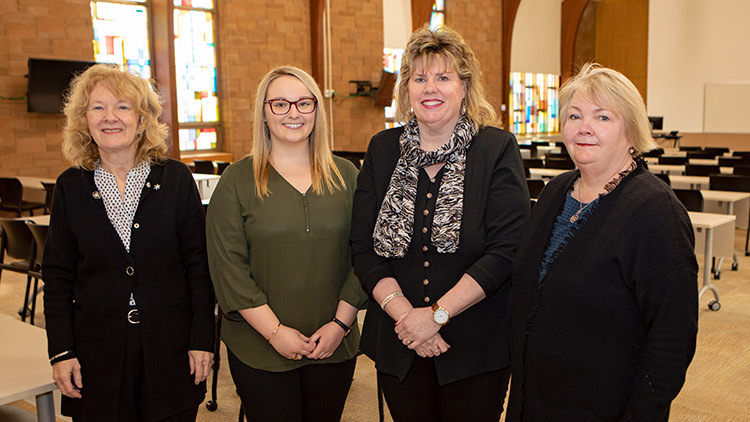 Laura Burns wanted to gain a better understanding of Mi’kmaq women’s experience in accessing prenatal care in rural Nova Scotia so, as an honours nursing student in StFX’s Rankin School of Nursing, she focused her undergraduate research work on the topic. The quality of that work has stood out—so much so that it’s been accepted as an article in a respected journal and for presentation at an international conference. Her research was accepted for publication in Advances in Nursing Sciences. The article will be published in the June 2019 print issue, and became available online in December 2018. In addition, in October, Ms. Burns, of Antigonish, NS, presented this research at the 44th annual conference of the Transcultural Nursing Society Conference held in San Antonio, Texas. Going forward, Ms. Burns, who has since graduated, says these experiences will continue to impact her nursing and her ability to connect with co-workers and patients, and better prepare her for what she needs to complete her master’s degree. She says since high school she always had an interest in Indigenous health care, and became interested in her research topic during her first year studying at the Rankin School. “My early education of the Mi’kmaq people was essentially through the lens of Caucasian, Euro-Canadian perspectives,” she says. “The importance of gaining an understanding of Mi’kmaq people’s experiences from their own perspectives became especially important during my first year at the nursing school, when I was introduced to the concept of cultural safety in the curriculum. Ms. Burns says through the research process, she had the opportunity to immerse herself in the literature, and also have engaging conversations with Mi'kmaq women in their community. She gives much credit to her supervisor Dr. Joanne Whitty-Rogers and second reader Dr. Cathy MacDonald, both Rankin School faculty, who she describes as mentors. “I couldn’t have done it without them. They’re very supportive, always led me in the right direction, listened to my concerns, and helped me along the way,” she says. For her part, Dr. Whitty-Rogers describes Ms. Burns as a dedicated, hard-working student who always tried to push as far as she could and went above and beyond in her work. She says it is a credit to Ms. Burns that the research was approved by both the StFX Research Ethics board as well as by Mi’kmaq Ethics. She says Ms. Burns has always been very sensitive and aware and respectful of the culture. “Laura is what you would want to have in an honours student,” says Dr. MacDonald, who noted it is quite an accomplishment to have your undergraduate research published. She says having this experience will make Ms. Burns an even stronger applicant for graduate school. Dr. Debbie Sheppard-LeMoine, who coordinates the honours and advanced major program at the school, says it is a proud moment to see all this come together. She says the Rankin School is unique in Canada in that it is rare in the country for nursing schools to offer advanced major and honours options as the degree itself is so intensive with so many required courses.